Listen to your edge – Lync Wireshark Plugin! Last night James Cussen, from the well known blog My Lync Lab, released a wireshark plugin for Lync to be able to decode even the “specialties” that Microsoft has added to protocols that Lync uses. I just tested it and it works great! A handy tool for any Lync professional. You can get it here: http://www.mylynclab.com/2014/05/microsoft-lync-wireshark-plugin.html and I also recommend that you follow him on twitter (@mylynclab). A short post, but I really wanted to share this. Now back to my reverse proxy testing for Lync 2013. Hello everyone. Time for another blog post. As you might have noticed, if you have read my other posts, I have been very focused on the security aspects of Lync. Today’s post is not any different in that aspect but it will focus on the standard Lync web service configuration when using any two-factor authentication for Lync. As you probably know most Lync clients retrieve a certificate upon a successful authentication towards the Lync front-end server. This certificate, like any, has a validity time and by default this is set to 180 days. If we take a step back and analyze that we can clearly see how that doesn’t go well with two-factor authentication. We implement two-factor authentication to raise the security bar and most importantly to be absolutely sure that the user logging in to our Lync really is who he or she claims to be. A user signs in using two-factor authentication. Then Lync provides the user with a one-factor authentication (the certificate) to be used for upcoming authentication purposes for 180 days. Kind of defeats the purpose to demand one two-factor authentication for 180 days. The tricky part is that upon an authentication the user is first given a webticket (by default valid for 15 minutes for external users and 8 hours for internal users), this webticket is then used as authentication to get the certificate. This certificate can then be used to get a new webticket and yes the webticket can then be used to get a new certificate… See where this is going? So what can we do? Well first and foremost we can change the validity time of the certificates that Lync creates. The following command shows your current configuration. By issuing the following command you set the validity period to 8 hours. This will not stop a client from using either the webticket or the certificate to renew itself, however the time frame is much more limited. This is important because, from my experience, only the PC client is able to keep signed in for a very long time (if kept powered on and never is rebooted). The mobility clients are often in sleep state where this “renewal” does not happen and as such they are prompted for the two-factor again. I’ve met quite some Lync customers that has a policy that state that the Lync PC client has to connect over VPN to get Lync access. Quite a nice policy. 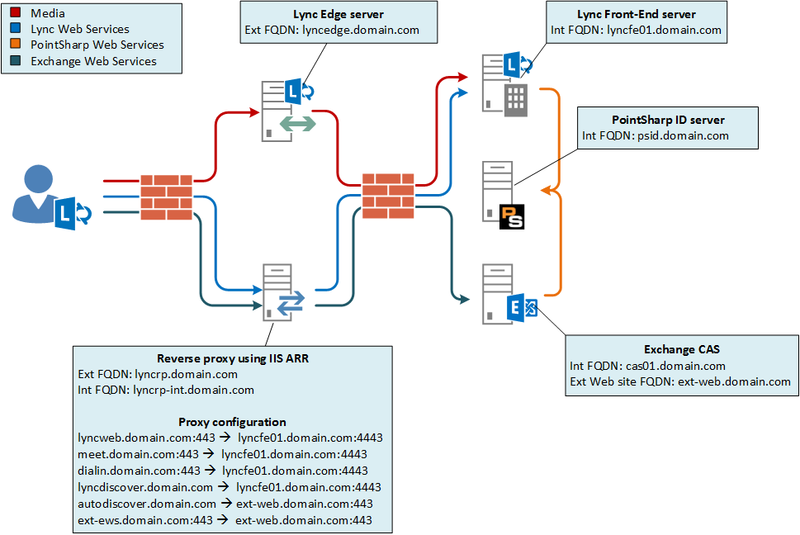 Before wrapping up I would like to take a second and thank Graham Cropley (@grahamcropley) for an excellent blog post about Lync certificate provisioning and beyond – http://www.lyncexch.co.uk/lync-certificate-provisioning-service-deeper-dive/. Thanks for reading! Stay tuned for more. Hello everyone, time for another post. A post that won’t be showing you how to do something technical but hopefully something that, if nothing else, can start a discussion. Don’t worry, more technical posts will follow. I have started getting quite some questions about Lync mobility, both in my daily work and through other means such as this blog. There seem to be a lot of Lync deployments that haven’t deployed mobility. It seems that security departments are reluctant to allow it. – We can’t allow storing of domain passwords on mobile devices. – Our policy requires the use of two-factor authentication for external access. – We don’t want to expose infrastructure if we can’t limit it to certain clients. Those are the most common I come across and they are all valid points. Those are the arguments I would use myself. In fact, they are excellent arguments and should be asked by any security department. The thing is that you can fulfill all these requirements for Lync. You can use an application specific password or you can use 2-factor authentication and you can limit the clients accessing Lync from the outside. What I’m getting at here is that Lync is truly a great application (but you already knew that) and while mobility might just be a small part, it is an awesome part. Don’t cripple your Lyncers, empower them! Hello everyone (and a special hi to Tom if you’re reading this)! As I mentioned in my post about increasing lync security there is another option to enable two-factor authentication or application specific passwords for Lync, apart from passive authentication. For most of you who attended Lync conference 2014; you have most likely already heard of this option. Why do we need another option? Well, for some organizations this option might be a better fit. There are some limitations to the passive authentication solution that this option does not have; like the below examples. When Lync passive authentication is enabled, it is enabled site wide, more correctly it is set on the Lync web services level (Get-CsWebServiceConfiguration). The integration between Lync and Exchange is lost which in turn means that features are lost in the clients, for instance the meeting calendar. Some clients does not support passive authentication such as the Mac client or several conferencing hardware products. While this isn’t a problem itself, it is quite a task to add to a Lync deployment if AD FS is not deployed already within the organization. 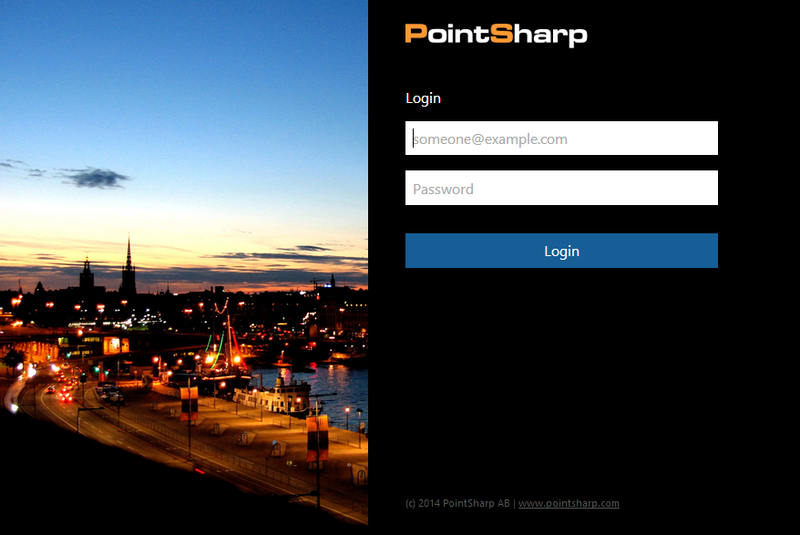 Enter the PointSharp authentication module. 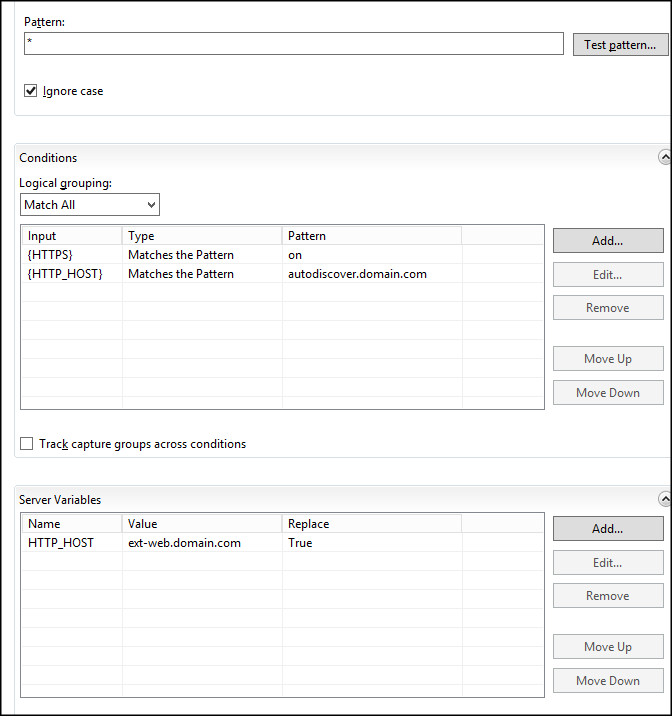 This is a third-party solution that integrates into the Front-End server’s IIS and takes over the authentication of the users. To get a bit more technical this solution protects the Webticket application externally and/or internally by presenting either a custom NTLM authentication or a SOAP based authentication. It uses the Windows APIs to create a Windows identity and then presents a valid user token to the Lync server. While keeping the Lync sign-in experience intact it provides the option for an application specific password or a true two-factor authentication using tokens. I was asked to do a demo with Lync and two-factor authentication without using domain passwords and in this case the passive authentication was not an option. There was also a requirement that only external clients have to use two-factor authentication. On top of this they also wanted to make use of the EWS integration. To get all this working I had to get a little creative. Let’s walk through it! I’ll start with a network overview as I believe that will make my ramblings easier to understand. For those of you who read lync passive authentication with two-factor authentication will recognize the image with some small changes. Specifically that the AD FS server is gone and an Exchange server is added for Exchange web services integration. First I had to install the authentication module on the Lync Font End server and configure it on the WebTicket web application on the Lync external web site. The configuration is done in the IIS management console and basically consists of pointing out the authentication server, to use NTLM and enable Lync support. Lync part done, on to the exchange integration. Since the Lync client uses the credentials entered for both the access to Lync, Autodiscover and EWS all three had to accept the authentication being sent by the client (yes, I know there is an exchange credentials option but it isn’t very user friendly). I didn’t want to “disturb” any internal clients so I used the same approach as Lync does and created an external website on one of the CAS servers. I configured the bindings to be host based using a name that isn’t DNS resolvable on the LAN. I then learned the hard way that creating new virtual directories for the autodiscover and EWS service by default points them to the same location as the original one, meaning that changes made on the external web application is also set on the original one. You don’t want to do this, trust me. So instead I needed to create new virtual directories, completely separated from the original ones. I first copied some directories. Then I created the virtual directories using the –Path switch. Then I installed the authentication module and used the same configuration both virtual directories as I did on the Lync server, except that I didn’t enable the Lync features. When this was done I had to configure the ARR to handle requests for the EWS and autodiscover and proxy these request to this newly created external web site on the CAS. First and foremost I had to add ext-web.domain.com to the host file of the ARR and point it to the IP-address of cas01.domain.com. Then I created two new server farms, one for autodiscover and one for the EWS. I also needed the ARR to rewrite the host header to match the configured binding. This is done in the URL rewrite module. First I had to add a server variable named HTTP_HOST. Then I edited the autodiscover rule to rewrite the header like in the image below. After this I did the same host rewrite change to the EWS rule and I was all set! The demo went perfect and everyone who does demos knows how good it feels when everything is spot on. Phew! long post, I guess i need one of these. TL;DR I configured stuff, made Lync authentication more secure, demo went perfect. For those of you who actually read all of it; thanks for your time, I hope you enjoyed it! Welcome back to part II in this series about “Lync Passive Authentication with two-factor authentication”. 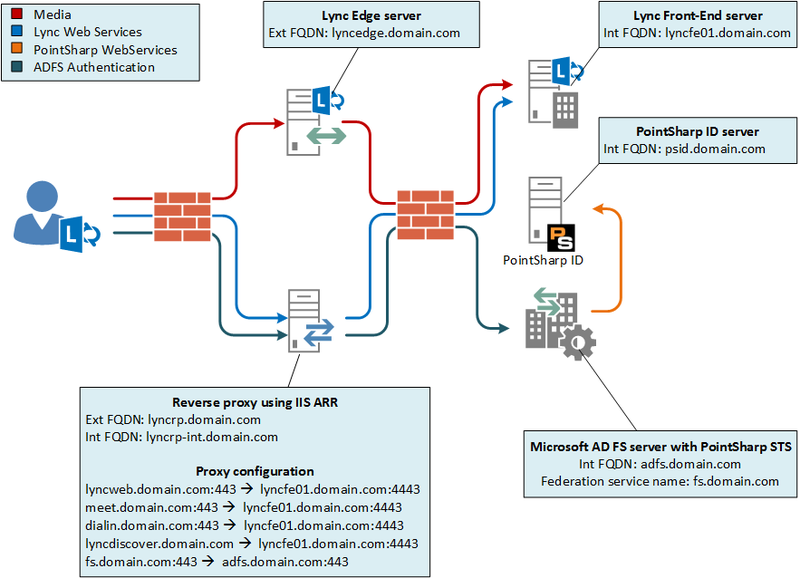 In part I we looked at the configuration of passive authentication both on the Lync server and on the AD FS side. Today we’ll take a look at how to add two-factor authentication to this. Lync passive authentication cannot do two-factor authentication by itself. It relies on AD FS to do the actual authentication. In turn AD FS requires a third-party authentication solution to bring two-factor authentication to the table. Let’s set the table! First we need to set up a Security Token Service (STS) that can do the authentication and get the correct claims and pass them to the AD FS which in turn will send us to Lync with claims that is trusted by the Lync 2013 server. In this setup I’m using PointSharp Identity Federation which includes an STS which I have installed on the AD FS server. Please note that the actual STS configuration depends on the STS you use but it should be similar for many. 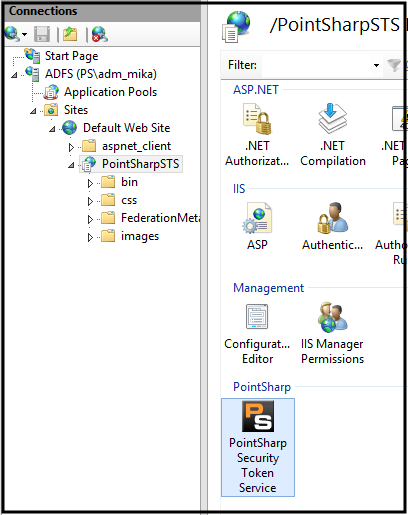 The configuration of this STS is done in the IIS Management console in a “snap-in” on the PointSharpSTS web application. There’s a few settings you need to configure for this to work. In this case we need to tell the STS where the authentication server is, which authentication method to use, who the issuer of the claims is, the URI of the issuer, the relying party URL and a signing certificate that the AD FS trusts. By looking at the above image and at the network topology image from part I of the series you will know what names should be put where. In my case the STS is installed on the AD FS server itself so the certificate used for signing the claims is the same as the AD FS uses. We also need to configure the claims the STS should create and pass on to the AD FS. Lync 2013 wants the primarySID claim. In this case we tell the STS to collect the attribute values of userPrincipalName and objectSID from the authenticated user and send the values as claims to the AD FS. The next step is to tell the AD FS that the STS is a trusted claims provider. The steps to do this differs a little between different STS’s. You can either use the <code>Add-AdfsClaimsProviderTrust cmdlet<code> in powershell or the AD FS management console. In my case the only thing I had to do was to point out the URL to the STS and give it a name (PointSharp ID in my setup for reference). When the STS is added it will be listed as a claims provider. We now need to make a claim rule to pass the primarySid claim through. This can be done in the management console but the below example is for powershell. 1. Create a text file on your AD FS server using your favorite editor and paste the lines below into it. 2.Save the file as C:\ClaimsProviderRules.txt. 4. Attach the claim rule to the claims provider. Set-AdfsClaimsProviderTrust –TargetName "PointSharp ID" -AcceptanceTransformRulesFile "C:\ClaimsProviderRules.txt"
The final step is to force users who want to use Lync to use the STS that we just configured. This is done by modifying settings on the relying party which is the Lync server. 2. 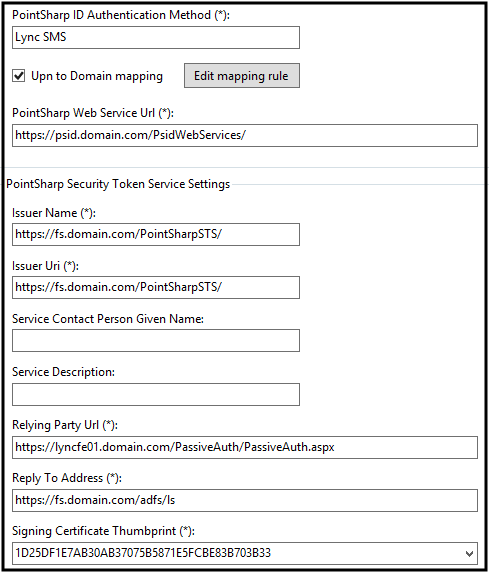 Modify Lync relying party (note that “PontSharp ID” is the name of my claims provider in the AD FS console). In the above example a hardware token was used to generate the OTP that provides the second factor in our two-factor authentication. As Shawn mentions in his comment, an SMS could also be used to provide the OTP. The sign in process is the same as on mobile clients, only the graphics differ. I hope you have enjoyed this series about Lync passive authentication with two-factor authentication”. This part concludes the series but stay tuned for more Lync security.